Rhode Island’s 200-foot Official Sailing Education Vessel SSV Oliver Hazard Perry sailed for the first time on July 17 in Narragansett Bay after she left the Hinckley Boat Yard in Portsmouth, RI to begin a journey up the coast to join the Tall Ships Portland 2015 festival. Anyone on or near East Bay Passage between seven and eight a.m. saw a truly amazing spectacle when four of the ship’s 20 sails were unfurled as crew members climbed aloft to set free the lines that secured them to the yards. On July 3, SSV Oliver Hazard Perry was dockside at the Newport Shipyard for the “Homeport Rhode Island” gala. The annual fundraising event celebrated the unprecedented $16 million economic development project, which has supported hundreds of jobs in the Rhode Island marine industry. It raised $122,000 while also honoring the non-profit organization’s Board Chairman Bart Dunbar for his unfailing devotion to OHPRI’s Education-at-Sea mission. With orange being the color theme, most of the 450 guests were decked out in their orange best. The signature drink, the “Dunbar Fizz,” also was orange, and wait staff from Blackstone Catering sported orange bow ties. Cocktail hour included tours of the ship, passed hors d’oeuvres and offerings from a fresh seafood bar, while dinner was served under a giant tent with orange globe lights. 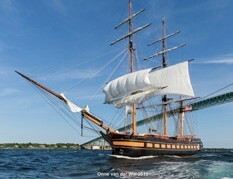 Click here for more information about the Oliver Hazard Perry.